Not sure how this depicts The Empress? Click here. Etteilla: Day, Clarity, Brilliance, Splendor, Zodiac, Occult Science, Mysterious Intervention. Illustration (left): The Empress (attributed to Bonifacio Bembo) from the Pierpont Morgan-Bergamo Visconti-Sforza Tarot (mid-15th century) (from The Visconti-Sforza Tarot Cards by Michael Dummett, copyright &COPY; 1986 George Braziller). Click the image for a larger one. Lévi: This woman, The Empress, is the Venus-Urania of the Greeks, and was represented by Saint John in his Apocalypse as the Woman clothed with the Sun, crowned with twelve stars, and with the moon beneath her feet. Christian: This woman is the personification of universal fecundity. Her crown of stars symbolises, by the number twelve, the houses or stations through which the sun travels years after year. She is celestial Isis or Nature. Papus: In the left hand she bears a sceptre forming the astrological sign of Venus. The sceptre is held in the left hand to indicate the passive influence, which Nature, Venus-Urania, or the woman exercises in the generation of beings. Felkin: The Empress is an aspect of Isis; the creative and positive side of Nature is suggested here. 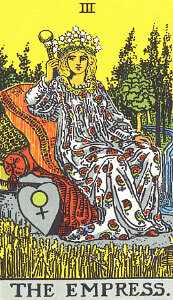 In interpreting practical Tarot it is often admissable to regard the Empress as standing for Occultism. Waite: The sceptre which she bears is surmounted by the globe of this world. She is the inferior Garden of Eden, the Earthly Paradise, all that is symbolized by the visible house of man. She is above all things universal fecundity and the outer sense of the Word. 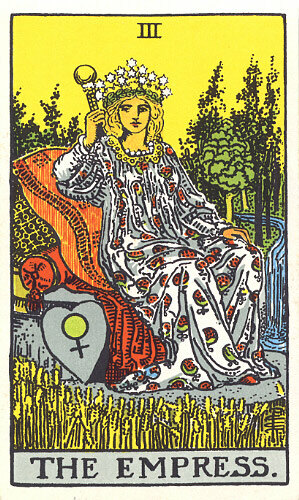 Illustration (left): The Empress from The Rider Tarot Deck designed by A. E. Waite, drawn by Pamela Colman Smith (1909) (copyright &COPY; 1971 U.S. Games Systems). Click the image for a larger one. 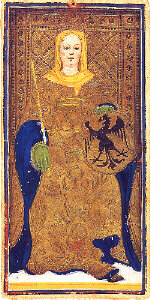 Wirth: This sovereign, the Empress, dazzling with light represents Creative Intelligence, the mother of form, pictures and ideas. She is the immaculate Virgin of the Christians, in whom the Greeks would have recognized their Venus-Urania, both shimmering in light out of the dark waves of the wild ocean. Case: Psychologically, the Empress represents subconsciousness as the mother of ideas, the generatrix of mental images. The power by which she works is the power of subdividing seed-ideas, derived from self-consciousness. This is the power of deductive reasoning. Crowley: The Empress combines the highest spiritual with the lowest mataerial qualities. For this reason, she is fitted to represent one of the three alchemical forms of energy, Salt. Salt is the inactive principle in Nature; Salt is matter which must be energized by Sulphur to maintain the whirling equilibrium of the Universe. Gray: Marriage, material wealth, sound understanding; fertility for would-be parents, farmers, or people in the creative arts. In the wrong position with respect to others cards, might indicate dissipation, luxury. Sadhu: The goddess of love has been called Venus. This explains to us the scientific name of this Arcanum, Venus-Urania, that is, Venus of the astronomical universe. Another scientific name is Phisis (Nature). The vulgar name is The Empress. Pollack: The Empress is pure emotion. She, along with such mythological counterparts as Aphrodite or Ishtar or Erzulie, represent something very grand. They signify the passionate approach to life. They give and take experience with uncontrolled feeling. ONeill: The Empress is Mary, the fecund Mother of God and Queen of Heaven, woman of the Book of Revelations with the moon under her feet. As the archetypal Mother, the Empress would recall to the Renaissance mind the earth goddesses Cybele, Demeter, Mother Nature. The Empress is also Venus, the goddess of Love. Turk: The Empress represents the basic ebb and flow of pulsating nature. A powerful feeling is in this card of ever-burgeoning life and the death which inevitably comes so that a recycling of souls can take place, moving the Universe one step further toward ultimate perfection. Symbol (top): It is best viewed sideways, stands for Venus or Woman, and often comprises, in part, this Arcanum.